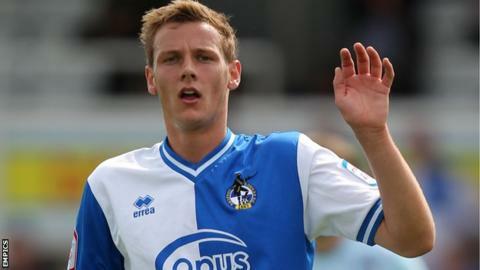 Bristol Rovers midfielder Seanan Clucus has been ruled out for the rest of the season with a cruciate ligament injury. The 20-year-old was stretchered off in Saturday's 1-1 draw with Morecambe and is expected to be sidelined for around nine months. The Northern Ireland U21 international is out of contract at the Memorial Stadium in the summer. "It's a real shame because he's been really good," manager John Ward told BBC Radio Bristol. "The club will look after him and make sure he gets the best care possible." Clucus joined the Pirates in July and has made 21 appearances for the League Two club. He is one of five Rovers players who are long-term absentees with knee ligament injuries - joining Matt Harrold, Adam Virgo, Matt Gill and Garry Kenneth. "There not niggly ones - they're big ones," added Ward. "There's nothing you can do about them. They are situations that are really tough for players because they are out for long periods."